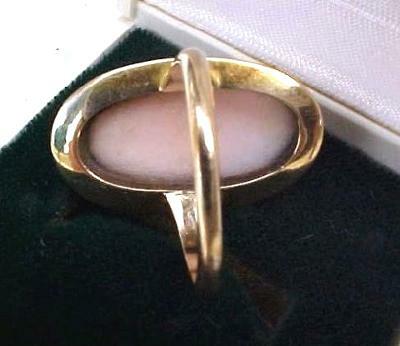 I have a cameo ring set in either 18 or 22k yellow gold that belonged to my great grandmother (I think, although it could be older). I am pretty sure the cameo is made of ivory and is very smooth with little detail, almost as if it had been worn smooth by years of wearing. 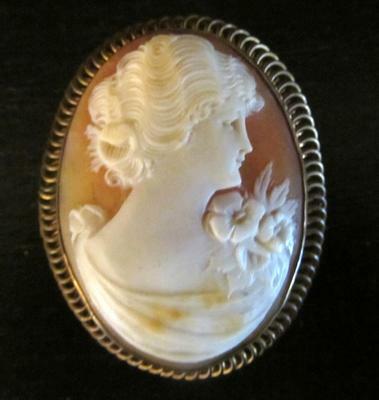 My question is this: can you tell approximately how old this cameo is from a photo (attached)? It doesn't seem to look much like any other cameo I have seen, they are much more elaborate. I like mine for its simplicity. 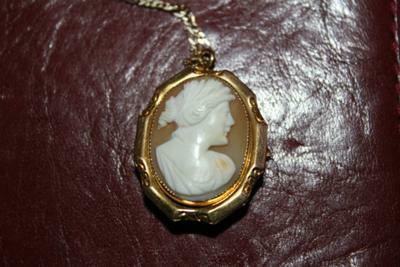 My Mother gave me the Cameo and told me it was from her Great-Great Grandmother. My mother was born in 1925. I have tried taking a better picture, but my camera is not the best so is there anything else. 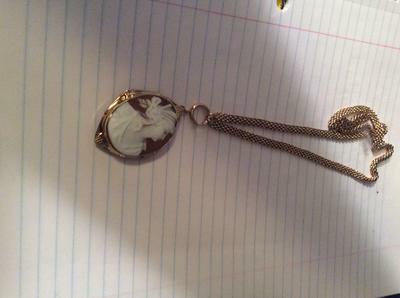 The cameo has no markings on the back, just the pin and a clasp to make it a necklace. The cameo front is very detailed. Not sure of age of cameo? 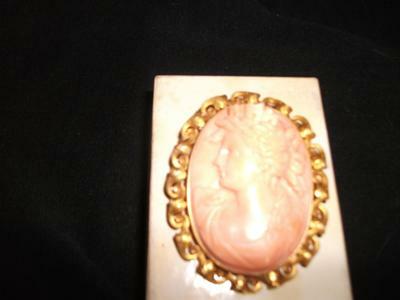 I was given this Cameo by my Mother, and she said it was her great-great Grandmothers, I am not sure of the age of this. How can I tell how old this one is? How old is my cameo? Please help! How Old Is My Cameo? How Can I tell How Old My Cameo Is? Ok, I have been hunting for days to find a cameo like mine, but I cannot. It seems very unique and looks like an antique cameo. 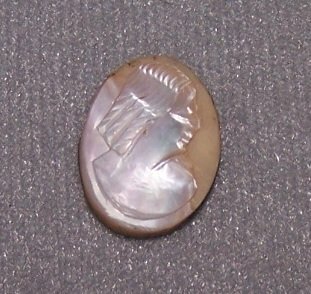 The actual cameo part is very small and looks to me like mother of pearl, but maybe a shell of some sort. The carving is beautiful, but simple in comparison to the fancy lines I see on all the rest. The pin part seems to be very old silver with a filigree look but made out of rolled metal, if you know what I mean. So there is a scroll look to the design. Around the edging is a small rope design, and in one spot you can see the where it's been soldered. 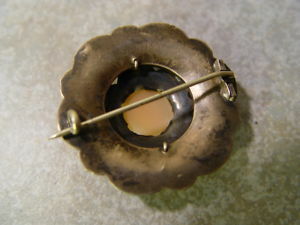 The pin is long from side to side with the cameo set in the middle. 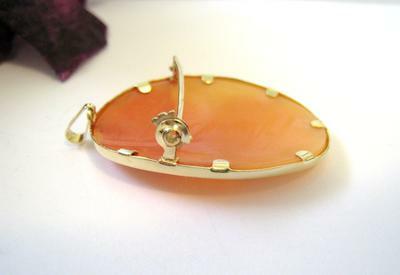 The pin on the back is not the modern lobster kind of clasp. I don't know if this description makes any sense, but I would love to know something about it. It seems very old. Thank you so much! I don't have a picture right now. Hello! I have had this for over twenty years. It belonged to my aunt. Would you be able to tell me the year it was made and what it is worth? How can I clean it? There is a signature on the back but I need to clean it. I am posting this again because I didn't really get any info on it the first time around. This is a piece i know very little about. I have no clue what kind of setting it was in but it looks like the face is made out of abalone or mother of pearl, definitely shell of some kind and the back feels like stone. it's cold and rough but thats just a guess. It came from my great grandmother's things that was handed down after she passed on. Any info I could get that would help me date it and find out the value would be greatly appreciated very much. I have 2 cameos that I don't know much about. 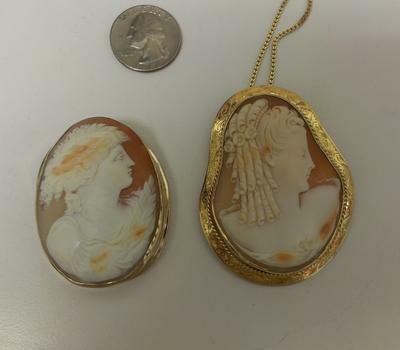 The first is what I believe to be a carved shell cameo and the other I am not sure of the composition.I was also wondering about their approximate age. There are no markings on either one. Hello! 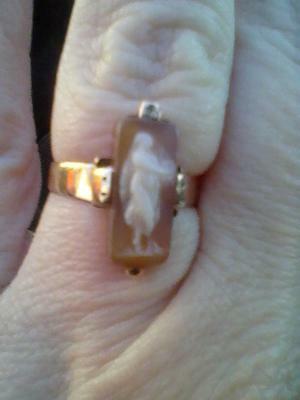 I bought this cameo ring at an estate sale and was curious as to it's age, origin and perhaps worth. I was going to list it and haven't a clue as to what to even write. Any help would be appreciated. I was also curious as to if you happen to know when they actually started stamping gold jewelry as it is stamped 10K. It is in gold with an open fretwork setting with 3 very blue sapphires bezel set. 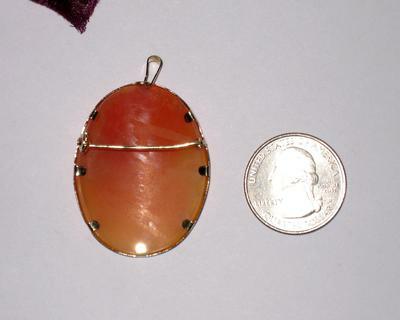 The chain is orginal and is a triple rolo with sturdy "c" clasp. It is in excellent condition. I am also wondering if they may be of Greek mythology? Is there an estimate of value? Both are 14k gold. If you could just tell me how much each of them are worth, where they were made, and how old they are. Also could you maybe point me in the right direction of an online place to sell them. 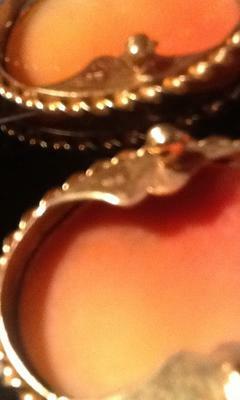 My cameo is on a silver pendant with no hallmarks. 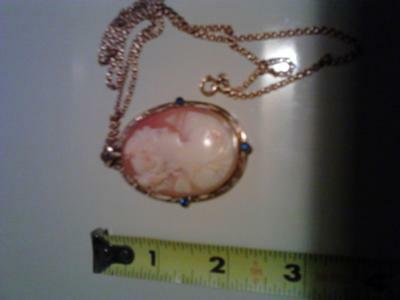 It's a cameo locket with 3 lady's. The lady in the middle has her back turned and has her arm's round the other two girls. 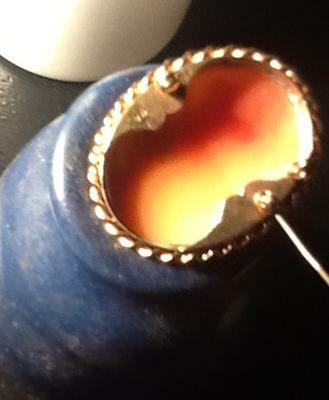 they all turn there head to face the front of the pendant. 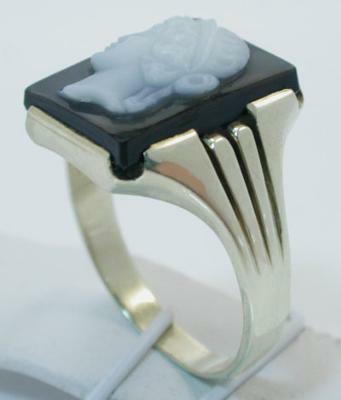 I've seen the design on a black cameo but not seen one like mine, could you please tell me what you think as i have no clue. 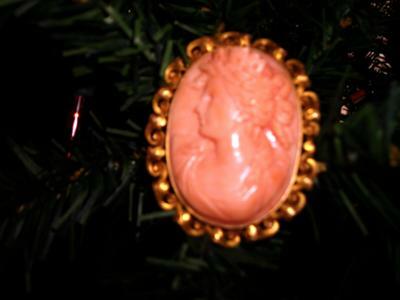 How old is this cameo that belonged to my grandmother? 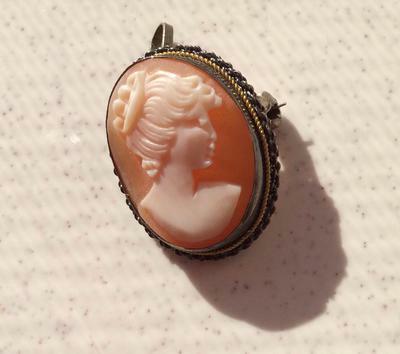 This cameo belonged to my grandmother. It had matching earrings, but I lost one. It is made of some engraved metal which I cannot identify and what would probably be ivory but seems more porous than ivory. The style of the portrait seems to precede the 19th century, but perhaps this is not true. I would love to know the age of my 2 cameos. I would love to know the valued amount of my 2 Cameos. But most important I would love to know the age of them. One I know is made out of some kind of shell but the other (which I am attaching front and back picture of it to you) I do not know what type of material it is made out of.. If you could please help me that would be wonderful. Thank you very much for your time. 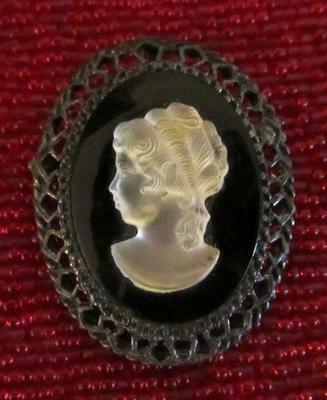 The pictured cameo brooch/necklace has been in my family for eons, but I don't really know a whole lot about it. I believe it to be 18th century, but I don't know if it is of UK or North American colonies construct. I would like to know more about it, if possible, so that I can get it appraised. My daughter and I have fallen on hard times and, as much as I hate to think about it because my ancestors will be in here haunting me nightly if I do it, I may have to sell it. Any help/info you can provide will be greatly appreciated. 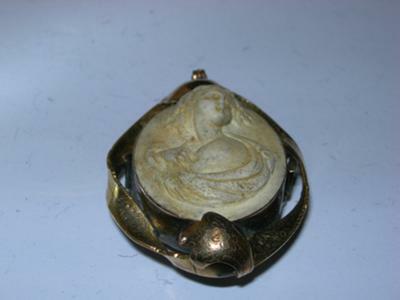 I have a cameo brooch/ pendant that I believe is carved from shell. It measures approx. 40mm by 32mm. Signed on the back of the shell that appears to be 3 or 4 letters in script. The frame is 14K gold. Total weight is about 8 grams. There is one small crack but that's the only damage I see. Can you tell me the age, value and where it was made? 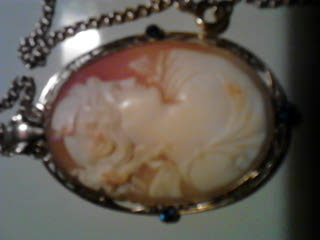 This cameo was given to me by my grandmother in 1966. I have no idea how long she wore it. Can you tell me how old it is and the value of it today? 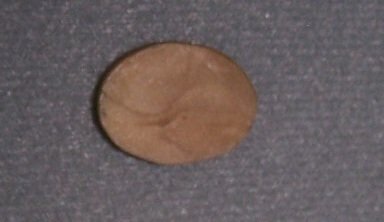 It's small; about 3/4" long. Markings are on the back, as you can see in the picture. 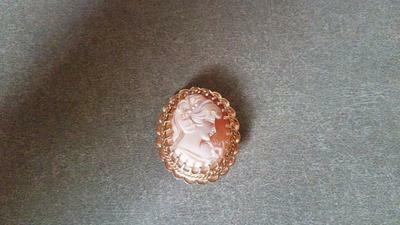 I have inherited a cameo ring from my mother, who said her great-grandmother gave it to her when I was born (1983). 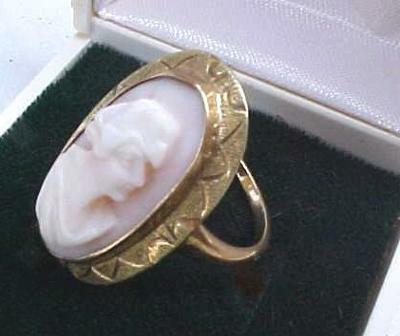 The ring is gold with fine detailing around the cameo. 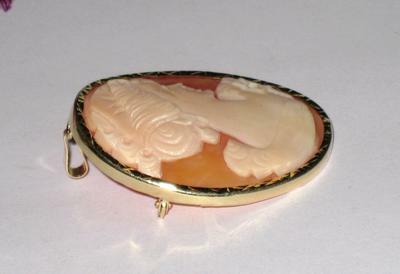 The cameo looks to be solid coral with a lady looking left (facing ring). In her hair is a diamond and her nose looks to be a strong roman nose. There are no markings on the ring showing karet size, etc. "14KcJ1" of "14KcJl". 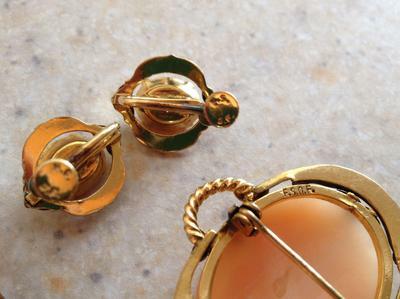 They were purchased as estate jewelry over 35 years ago and dont know how old they already were at that time. Thanks for any information you can offer me! 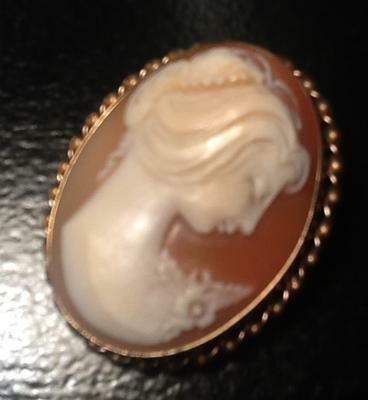 How old is my ivory cameo? 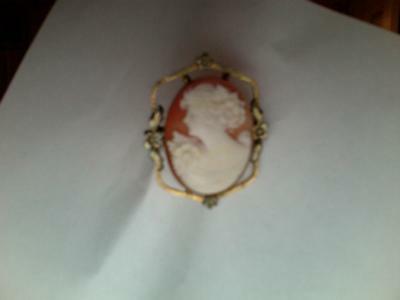 I have and oval cameo made of ivory. It is surrounded by very tiny pearls and all of them are still intact. How do I find out how old it is? 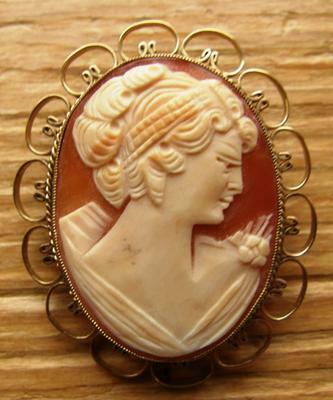 Can you tell how old this Cameo brooch is by the pin? Hi, I have no idea why I bought this except that it looked old, beautiful and I never owned a cameo. Can you tell me by looking at it how old it is and what value it might have? 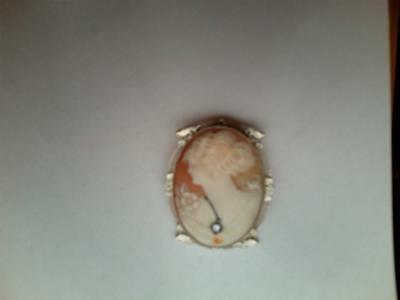 The cameo is translucent when held to light and the stones are agate. Measures almost 2" across. How Old Is My Wedgwood Cameo Bracelet ? 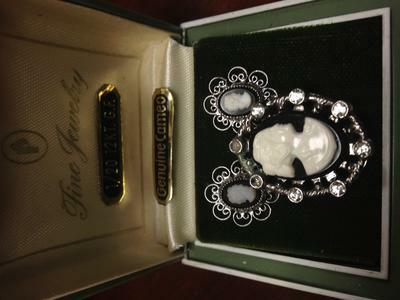 I have a sterling silver cameo bracelet that I received when my great aunt passed away. She was 94 years old. I am not sure what the stone is. It is a darker blue with white in the design. The cameo subject are men in gowns holding maybe swords and what looks like a thin tree behind or in front of them. It is marked "Wedgwood" with a small mark below the name. Very nice silver work with a safety chain. Any ideas ? I can send a picture if you would like. What is the value & age of this cameo? 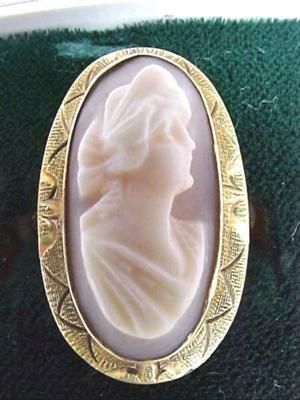 Hi, I just want to know what the value of this cameo is however, I would also be interested in its age, origin & the material it may be made from, for sale purposes. 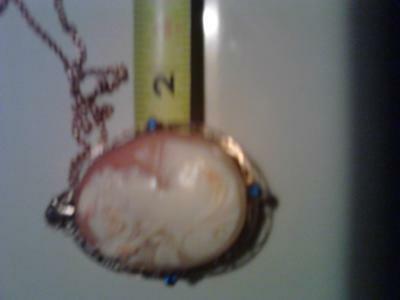 It looks like it had a chain connected also...I have added photos but they are not the best due to camera..The pictures of the back are vague pics of the markings & one I have tried to take in a mirror incase the reflection made it clearer but I don't think it did. 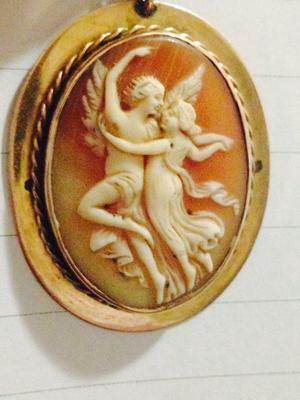 I love family history and wanted to see if anyone could tell me something more about this cameo set my grandma gave me when I was younger. I've had it for a very long time, but don't have any history on it. I have tried researching it, but I don't find anything like it so it just makes me more interested to know its history. Like how old is it, how many were made, what is it made out of, value, etc. Is this something I should keep and pass on? Your help is appreciated. Just would like any info about this ring. I have an Italian cameo brought back in the late 1800's or early 1900's, to the best of my knowledge. It has a concave back, which looks like shell. and an ivory-looking head on the front, of what appears to be a Roman woman, judging from the hair and dress, full-face, with the nose worn (or perhaps was never prominent). It sits in a gold filigree base. I'd love to know the date and origin of it, and the estimated value, if possible. This cameo was my great grandmas I'm not sure how far back it goes. But I was curious to how old it was. Because I haven't found any with this image. 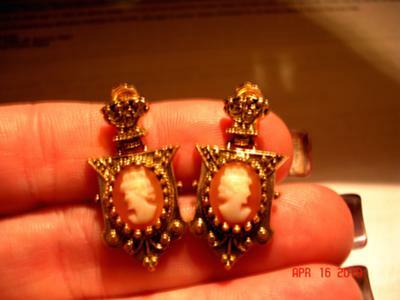 Wondering how antique my cameo set is? I have a cameo set and wondering on what it's worth. It is gold filled. 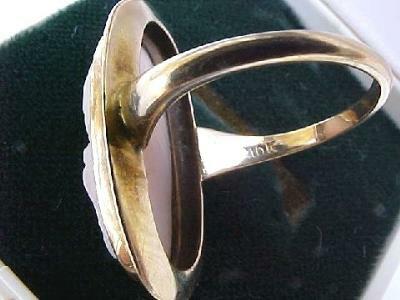 I found this ring in my late mom's belongings. She would have been 87. It may have been her mom's or grandma's. It appears to be gold, but I can't see any markings. The band has a design and 2 small diamonds. Any information would be appreciated. Is my cameo Angle-skin, her age, origin etc. 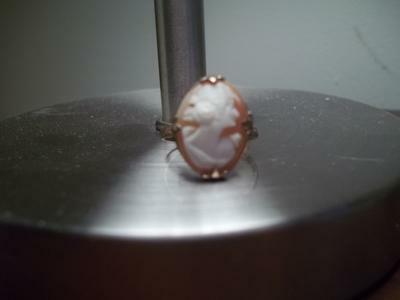 I have an old cameo ring that is marked 10K. My first question is, when did they start stamping rings? 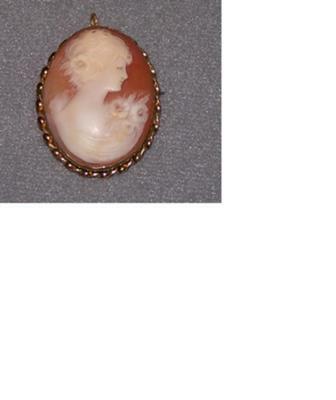 I thought from what research I had tried to do already, that the "style" of the cameo dated to the late 1800's but I don't know if that could be, due to my ignorance as to the stamping. Also, if I could find out perhaps when it might be from and if it is what they call angelskin? 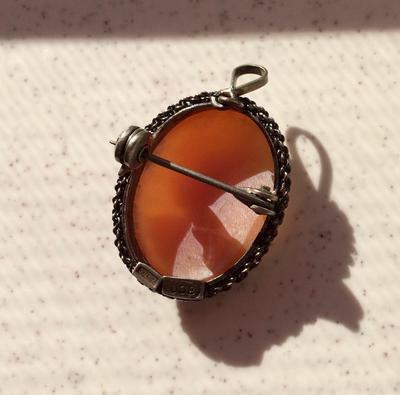 Or do you think it was carved of coral or onyx, etc. and then of course lastly the worth if possible. I appreciate any help and education if you will.